This is a recipe I have been wanting to create for a long time. It's inspired, obviously, by the Taco Bell Mexican Pizza. 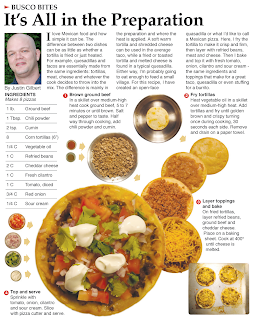 The biggest difference is that I use corn tortillas, while the Bell uses flour. This is the third pizza I have made for the column, and I must say it is probably my favorite so far. The first two pizzas I featured in the column were composed in a very similar fashion, but this one took a little more work. The end result was a nice, functional presentation that leads the reader very clearly through the cooking process . The other pizzas were made on pre-made crust while this one features the fried tortilla. I thought it was important to visualize this step as well as spicing up the meat. The two steps are key to the texture and flavor of the dish. Instead of photographing each layer of the fresh ingredients as they were added, as I did with previous pizza recipes (http://behindthebites.blogspot.com/2011/03/pizza-for-breakfast.html), I chose to show the final step with all the prepped ingredients to the left. It saved me space and I think effectively shows the final stage of the pizza. As I mention in the introduction, Mexican food is so simple. 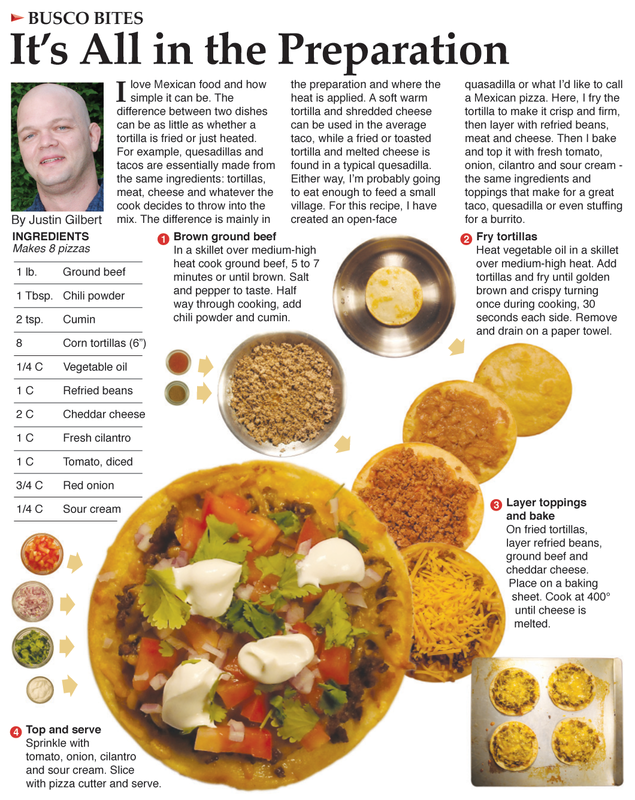 It takes just a few ingredients in your pantry to make several different Mexican-themed meals - and they are relatively inexpensive to make. When you're in the mood for Mexican, stock your pantry right and a delicious meal can come together much faster and cheaper than a run to the Bell.